This year it’s more important than ever to join us in the sanctuary city of Bettona. All are welcome to explore our beautiful town. Our (recently restored) town gate will remain open 24 hours a day. No lines, no showing identity cards or passports. Our many churches and chapels even welcome women. (No need to pin a tissue to your head either.) Bars will happily serve anyone at our counters. (You will also not be persecuted for ordering a cappuccino in the afternoon, so order away.) Restaurants happily welcome non Italian speaking people. 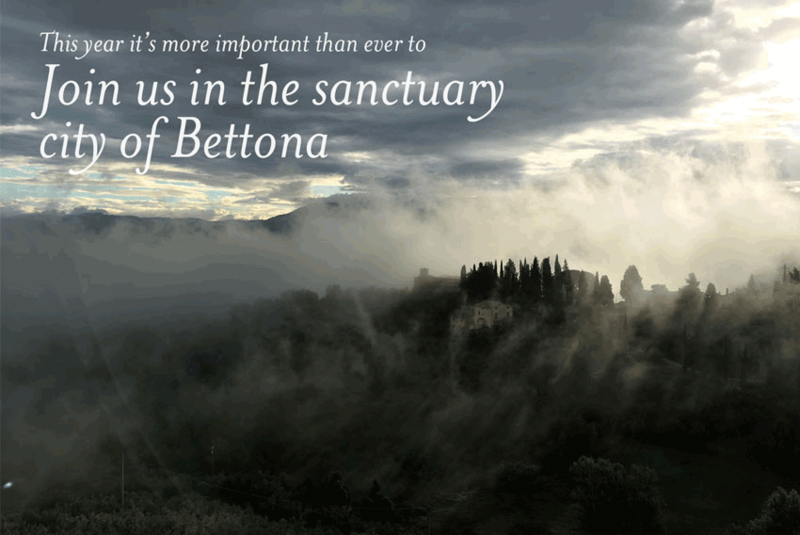 Once you arrive in Bettona you will be treated as our honored guest. Stay in a beautifully restored 17th-century palazzo where you’ll find comfortable beds, soft towels, and a welcoming host to help make your visit to Umbria memorable. One and two bedroom apartments and B&B rooms available. Go to accommodations for more info.